Only a few minutes' walk from Monument Square in Concord MA, Sleepy Hollow is one of America's most beautiful and famous cemeteries. Designed as an early American example of the garden cemetery, Concord's Sleepy Hollow Cemetery was inspired by Ralph Waldo Emerson's philosophies as well as Sir Christopher Wren's earlier idea of designing landscaped burial grounds located outside of churchyards and city centers. In fact, it was Emerson who gave the speech at the dedication of Sleepy Hollow Cemetery in 1855. Paris's Père Lachaise Cemetery, opened in 1804, was the first full example of Wren's ideas, and is still a model for the best. The first garden cemetery in the USA, and one of the finest, was Mount Auburn Cemetery in Cambridge MA. The cemetery is only a few minutes' walk northeast from Monument Square (follow "Route 62" signs; map), but it's a 13-minute walk from the square to Authors Ridge, which rises at Sleepy Hollow Cemetery's northeast edge. If you're following my Concord Walking Tour, on your way back from the Old Manse and Old North Bridge, along Monument Street, turn left on Court Lane before you reach Monument Square, to get to Sleepy Hollow Cemetery. Click here to download a map (1.92Mb pdf) of Sleepy Hollow Cemetery, courtesy of The Friends of Sleepy Hollow Cemetery (PO Box 1245, Concord MA 01742). 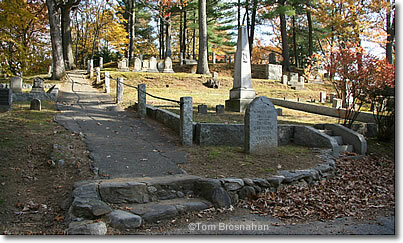 Authors Ridge holds the graves of Louisa May Alcott, Ralph Waldo Emerson, Daniel Chester French, Nathaniel Hawthorne, Henry David Thoreau, and their families. On the side of Authors Ridge is the grave of Ephraim Wales Bull, inventor of the Concord grape, from which the Welch's company made a fortune in grape jelly and juice. Bull, who died without profiting greatly from his useful agricultural development, has a tombstone inscribed He sowed, others reaped. Also worth seeing are the grave of Daniel Chester French and, nearby, his Melvin Memorial, a large, fine funerary monument featuring his Mourning Victory, executed by French in honor of three brothers of the Melvin family who died in the Civil War. 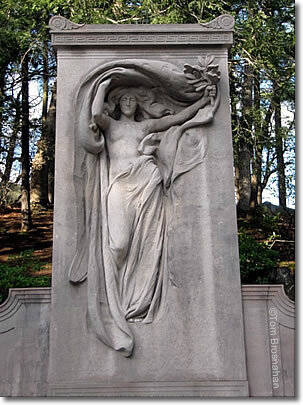 Mourning Victory, the Melvin Memorial, by Daniel Chester French, in Sleepy Hollow Cemetery, Concord MA.